Courtesy Shuttle Services are offered daily from 9 am to 3PM. 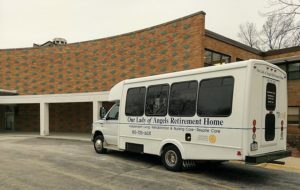 The transportation van includes a lift for those who travel by wheel chair. We ask you to place your request for transportation 24 hours in advance of your trip whether to the doctor or general outing.